Julan “Iron Fist” Brown knocked Jamaica’s Miguel “Iron Dog” Ray to the canvas several times during Saturday’s Clash of the Irons II, which unlike the first encounter lasted three rounds, this one turned into an eight rounds slugfest at the Multipurpose Sports Complex, but every time he went down, the Iron Dog got up and kept fighting. Brown, who was cut over his right eye by Ray and was examined by the ringside doctor didn’t plan for the fight to go the distance. Ray who lost 68-79, 70-77 and 72-78, said he conditioned himself better this time around and was a little more focused. Antigua and Barbuda had two, including Yakita Aska who narrowly missed qualifying for the summer Rio Olympic Games. Aska won his last outing here in August. Bowers who came out aggressive said Warner is a professional. “I need a lot more training to get where he is today,” he stated. The card opened with 12 year olds Omari Lee and Kavon Wheatley, with Lee getting the victory. 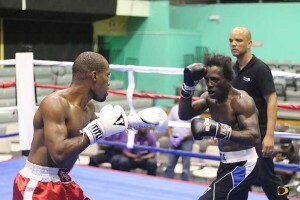 Niquan Todman bested Johan Marlinece in the second bout. 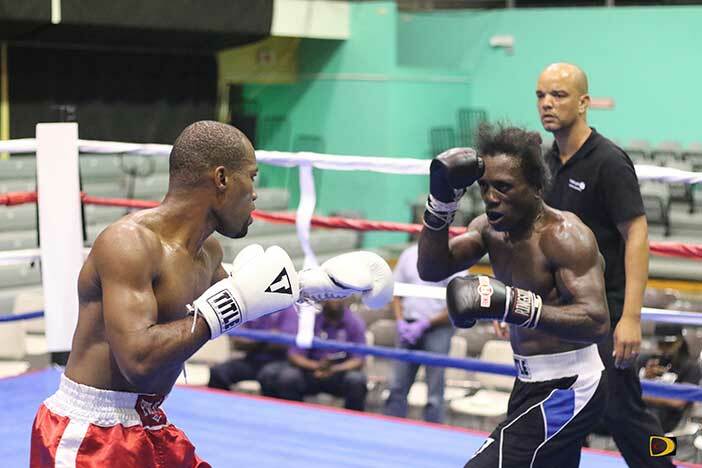 Tevon Chalwell got a victory over Romario Morgan and Cecil Williams got a surprised victory over Kevin Chinnery.